Answers by Kaisa Tooming, Project and Team Manager at the acclaimed design agency Fraktal. Kaisa, what is it that makes good (web) design good design? According to design thinking, good design targets a problem. It could be raising awareness about a brand, bringing in contacts with a company’s end consumer, or optimizing sales transactions by developing the user experience. For me, design serves function first. Understanding the end consumer, combining function with esthetics — that’s what we do at Fraktal every day. Knowing that, what do you think about web trends – how do you know which trends are worth following? In the web, trends often go hand in hand with the strides made in technology. Some trends stem from the development of technology and technological tools, but some trends have more to do with esthetics. If a trend makes the user’s path clearer and more convenient, then progress is justified. For a long time, it’s been trendy to use animation and illustrations to describe processes. Even blockchain technology can be explained more easily using such a combination of images and text. I generally think that a professional agency is capable of picking up on the most viable trends and utilizing them effectively for its clients. Speaking of professionalism: what are the main things about design you have to explain to clients time and time again? Set clear sights for the project. Remember they’re not creating design for themselves, but for their end consumers. 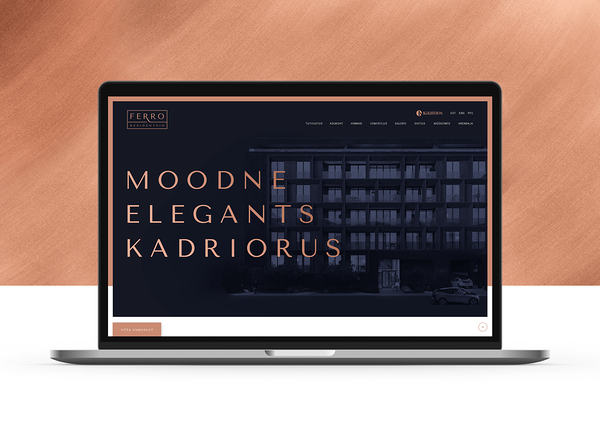 A website designed by Fraktal for Ferro recidences. How can clients be smarter, or what kind of advice you’d give to someone who’s planning on commissioning design work? I suggest they identify the problem that the design is supposed to solve, and places where the agency could add value. The ensuing analysis — wording the problems, identifying the challenges and developing the solutions – is done in cooperation between the client and the agency. When it comes to the relationship between the client and the agency – one of the winning designs at the Golden Egg competition this year plagiarized Malika Favre’s work. How often does that happen in the design world? Plagiarism happens every now and then. It’s important here to draw a line between plagiarism and original creation. Designers often use works by other people as examples of style. However, if the design is bluntly copied, it’s no longer inspiration, but intellectual property theft. How to choose a design agency? What are your tips? You should consider several aspects when it comes to picking an agency. First, make sure to define why you need an agency and what added value could the agency bring to the table both for the client and the end consumer. Then it’s all down to factors like the agency’s skills and experience, the portfolio, and of course human contact and synergy. Advertising and design projects are collaborative, they’re the result of common goals, mutual trust and communication. Fraktal’s best works were born out of mutual trust between the parties. Award-winning website designed by Fraktal for Balteco. But what makes Fraktal stand out among other Estonian agencies? Fraktal works with both substance and form. We advise clients from the very first ideas up to making them come true visually in the branding and digital world. Thanks to design thinking and applying it, we’ve been able to create added value for a variety of areas — both for the hottest startups in Estonia as well as top companies in other fields. Lastly, where can people find you, both online and IRL? Create a website with great design on your own. You can do it!